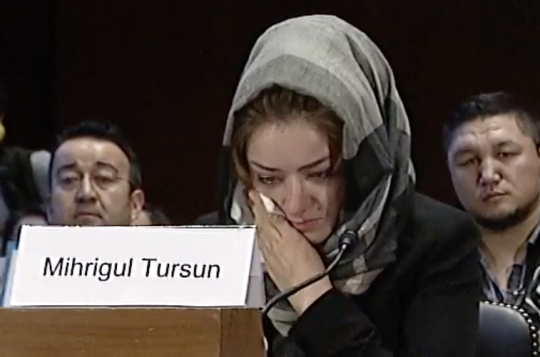 Mihrigul Tursun, a Uyghur Muslim who survived a re-education camp in China, testified before a congressional committee Wednesday and called for Uyghurs to have independence from China. The Chinese communist government maintains control of what it calls the Xinjiang Uyghur Autonomous Region, where it has set up re-education camps as part of a comprehensive regime of religious persecution and human rights abuses, according to the Congressional-Executive Commission on China’s latest report. Chinese authorities have imprisoned Uyghurs in the name of "national security," an explanation human rights advocates and experts dismiss. "The Chinese Communist Party—its concept of what we would call ‘national security' I think is better translated as ‘party-state security,’ and party-state security is fundamentally about protecting the Chinese Communist Party," said Samantha Hoffman of the Mercator Institute for China Studies, who explained that such a position involves controlling ideas in and outside China’s borders. She said the "social credit" system is part of this larger goal, to coerce people into managing their own lives in accordance with party goals. Sen. Marco Rubio (R., Fla.), who chairs the commission, said the Chinese Communist Party’s severe repression of Uyghurs comes from "the Party’s enduring fear that growing religious belief is a threat to its hold on power." Tursun is the mother of triplets, one of whom died at four years of age. All three were taken from her by Chinese authorities after she returned to China from Egypt, where her kids were born. Her testimony about her time in a re-education facility provided further evidence for the idea that Chinese authorities are oppressing Uyghurs on account of their identity. "Being a Uyghur is a crime," she was told. She was imprisoned without being charged with a crime. She described horrific conditions in which 60 women were kept in a single cell of 430 square feet, having to rotate who slept and who stood. Many of them had not showered in over a year, and she saw several of them die. They were required to sing songs praising Chinese President Xi Jinping and spout communist slogans such as "leniency for those who repent and punishment for those who resist." Worst of all, she testified, was the torture they were made to endure by the men who ran the camp. Tursun also recounted how she was strapped to a "tiger chair," which constricts victims and enables torturers to electrocute them. "I would rather die than go through this torture and begged them to kill me," she said. She said it was a "miracle" that she was finally released. She was forced to read a statement on camera swearing her love and fealty to China. Now she lives in America, however, and in her statement she expressed deep thanks to be here with her two children. "Thanks to the help of many wonderful people, I was able to come to the United States. I cannot describe with words how I felt when I landed in Virginia on 21 September 2018," she said. "I was overwhelmed with the sheer joy of freedom and a deep sense of confusion that day. Did I already die in the camp and was now in heaven? Or was I really in this free and great country that I have always dreamed of coming to? It was too good to be true." She and her children still suffer from trauma, however, and Chinese authorities have shown they do not approve of her actions. Her brother contacted her to say she must renounce her statements about China and return, and she worries the Chinese have people surveilling her. This is a problem Uyghurs face generally, she said, asking the U.S. to continue being a "beacon of hope for the oppressed people around the world" by admitting Uyghur refugees and putting pressure on China to cease its crimes against humanity. She also said Uyghurs should have their own country free of Chinese rule. "I hope to tell [President Trump], please please, if you can, help us—independent East Turkestan, get out China from our country. Help my father and mother," she said through tears. Rep. Chris Smith (R., N.J.), co-chair of the committee, pointed out the broader crimes against humanity China has committed by detaining lawyers and persecuting religious people. He called for sanctions not only on Chinese officials but on companies that are complicit in these atrocities. Sen. Angus King (I., Maine) asked Religious Freedom Institute president Tom Farr why Uyghurs would be treated as such a grave threat when Tursun and others haven’t seemed to do anything to hurt China. Farr said China’s problem with Uyghurs is the same they have with Christians and Buddhists, which is that religion is incompatible with communism. "Religion threatens communism," Farr said. "Communism is a totalitarian understanding of the world and what a human being is." He explained the Chinese communist view by noting the fundamental difference between the Founding Fathers’ view of limited government, which requires religious freedom, and Marxism, which allows for no divine authority. He added that the "threat" of religion is growing because Christianity is spreading with such speed that China could soon have the largest Christian population of any country. "This scares the dickens out of the Chinese," Farr said. This entry was posted in Issues and tagged China, Communism, Marco Rubio, Religion, Religious Freedom. Bookmark the permalink.